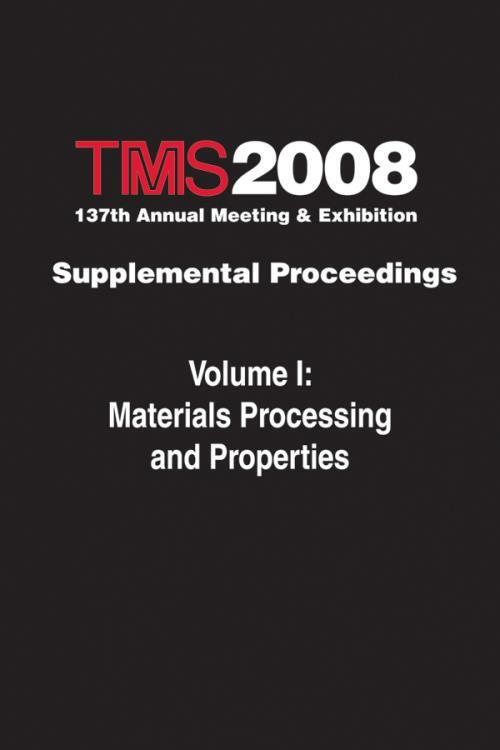 This volume contains a collection of papers from 10 symposia, related to materials processing and properties, held at the TMS 2008 Annual Meeting & Exhibition in New Orleans, Louisiana, March 9–13, 2008. Topics include nanomaterials; ultrafine–grained materials; nanoscale phases; micro–engineered particulate–based materials; surface engineering; mechanical behavior of titanium; refractory metals; interfaces in multicomponent materials systems; and complex oxide materials. Supplemental Proceedings: Volume I: Materials Processing and Properties. 2008 Nanomaterials –– Fabrication, Properties, and Applications. Effect of Nb and Sn on the Transformation of a to ß–Ti in Ti–35 Nb–2.5 Sn Nanostructure Alloy Using Mechanical Alloying (A. Omran, K. Woo, D. Kim, S. Kim, D. Zhang, and N. Barakat). Nano–Diamond Coatings for Machining Applications (J. Hu, K. Chou, and R. Thompson). Nanowires of AlN and Si3N4 Prepared from Amorphous Powders (Z. Han, M. Lü, M. Yang, and H. Zhu). Structural Identification of Nanocrystals in the Transmission Electron Microscopy (P. Moeck). Study on Nano–Alumina Prepared by Low–Temperature Combustion Synthesis (R. Guo, J. Wang, and X. Zhai). Synthesis and Characterization of Nano–Spinel Lithium Manganate (X. Xie, S. Yan, H. Zhou, W. Huang, W. Luo, and X. Li). Temperature and High Energy Si Ions Bombardment Effects on the Thermoelectric Properties of GdFe4Sb6–yGey Thin Films (S. Guner, S. Budak, C. Muntele, and D. Ila). Thermoelectric Generator from Sequentially Deposited SiO2/Gd0.1Fe4Sb0.1Ge4.23 Nanolayers Modified by MeV Si Ions Bombardment (S. Guner, S. Budak, C. Muntele, and D. Ila). Atomic Layer Deposited Thin Films and Their Applications (H. Jeon). The Usage of Nano–Structure for Direct Harvesting of the Nuclear Particles Energy as Electricity (L. Popa–Simil, and C. Muntele). Continuous Manufacturing and Novel Coating Technologies of Photocataylytic Nanoparticles (C. Wögerer, N. Stelzer, and H. Noll). Electron–Phonon Interaction in Nanodevices (K. Král). Damping of Hybrid surface Plasmon Modes in Ag Nanoparticles; Application to Vapor Sensing (S. Karumuri, and K. Kalkan). Electrophoretic Phenomena of Fine Particles in Aqueous and Non–Aqueous Solvents (J. Shibata, D. Yamashita, M. Tateyama, and N. Murayama). Position Controlled Fabrication of Metal Nanostructures with Focused Electron Beam (K. Furuya, M. Takeguchi, M. Song, K. Mitsuishi, and M. Tanaka). Phase Field Modeling of Nanscale Island Dynamics (Z. Hu, S. Li, J. Lowengrub, S. Wise, and A. Voigt). Temperature, Thickness and MeV Si Ions Bombardment Effects on the Thermoelectric Generator from Er0.1Fe1.9SbGe0.4 Thin Film (S. Budak, S. Guner, C. Muntele, and D. Ila). Synthesis of 1–D Nanostructures of Trititanate Thin Films on a Titanium Metal Flake (S. Kim, Y. Guo, N. Lee, H. Oh, K. Park, S. Jeong, and S. Kim). Sonochemical Synthesis of Nanostructured Anatase and Kinetics of Phase Transformation and Coarsening at Different Heat Treatment Conditions (L. Gonzalez–Reyes, I. Hernández–Pérez, H. Dorantes Rosales, E. Arce Estrada, and F. Robles Hernández). Fabrication of Hexagonal Barium Ferrite Nanoparticles by Carbon Combustion Synthesis (K. Martirosyan, Y. Wang, L. Chang, D. Luss, and D. Litvinov). Chemical Synthesis and Magnetic Properties of Cubic Morphology Fe3Pt Nanoparticles (M. Mandal, M. Shamsuzzoha, and D. Nikles). Grain Growth Behavior and Consolidation of Ball Milled Nanocrystalline Iron–Chromium Alloys (R. Gupta, R. Singh, and C. Koch). Specific Heat and Thermal Conductivity Measurements Parallel and Perpendicular to the Long–Axis of Cobalt Nanowires (N. Pradhan, H. Duan, J.. Liang, and G. Iannacchione). Structure and Hardness Evolution in Nanocrystalline LIGA Fabricated Ni–6.7at%W Alloy at 873 K (A. Haseeb, and K. Bade). Ultrafine–Grained Materials: Fifth International Symposium. Intrinsic Microstrain in Nanocrystalline Metals (J. Markmann, V. Yamakov, A. Stukowski, K. Albe, and J. Weissmüller). The Effect of Grain Size on the Property of Magnesium Alloy AZ31 (J. Wang, D. Yin, J. Liu, J. Tao, and Y. Su). Application of ECAP for Ferritic Stainless Steel Sheets to Control Texutre and Alleviate Ridging (H. Miyamoto, N. Jinbo, M. Hatano, and T. Mimaki). Mechanical Properties of Ultra Fine Grained Aluminum and Iron Produced by Accumulative Roll Bonding Method (S. Tamimi, M. Ketabchi, and N. Parvin). Microstructure of a FeCoV Alloy Processed by Equal Channel Angular Pressing (Z. Du, J. Wang, Q. Wang, and H. Fu). Microstructure Refinement of Ti–6Al–4V during Warm Deformation (S. Zherebtsov, M. Murzinova, S. Mironov, G. Salishchev, and L. Semiatin). Stored Energy and Recrystallization Temperature of High Purity Copper after Equal Channel Angular Pressing (Y. Zhang, J. Wang, C. Cheng, and J. Liu). Hume–Rothery Symposium – Nanoscale Phases (Invited Only). Employment of Oriental Philosophy in the Establishment of Framework for Probing Nanoscale Science and Technology (J. Duh, and C. Peng). Alloying Events in Three–Layer Au/Pd Nanoparticles (D. Ferrer, and M. Jose–Yacaman). Structures and Properties of ZnO/SnO2–Cosubstituted In2O3 Films (M. Zhang, S. Xie, D. Buchholz, and R. Chang). Grain Size Refinements in Al–Mg and Cu–Mg Alloys by Hydrogen Heat Treatment (A. Kamegawa, and M. Okada). Application of Microscopy to Nanoscale Organic Materials (S. Isoda, and H. Kurata). An EDX–Based Oxidation Test for Evaluating Cu Out–Diffusion in Pre–Plated Cu–Alloy Leadframes (L. Liu, and T. Zhang). Fatigue Design Diagram (FDD) Code to Design Compressive Residual Stresses to Improve Performance of Damage–Limited Components and Structures (N. Jayaraman, P. Prevey, R. Ravindranath, and M. Shepard). A Functionally Graded Design Study for Boron Carbide and Boron Carbonitride Thin Films Deposited by Plasma–Enhanced DC Magnetron Sputtering (T.Tavsanoglu, O. Yucel, O. Addemir, and M. Jeandin). Reduced Wear and Friction Losses by DLC Coating of Piston Pins (R. Morgenstern, W. Kießling, and S. Reichstein). Grain Boundary Engineering of Superalloys for Aerospace Engine Applications (P. Lin, V. Provenzano, R. Heard, H. Miller, and G. Palumbo). Diffusion Alloying of Thin Stainless Steel Foils by Simultaneous Addition of Al and Reactive Elements (D. Pilone, F. Felli, and U. Bernabai). Cold Roll Bonding and Annealing Process to Produce an Intermetallic Layer on Ti Substrate (D. Pilone, and F. Felli). Minerals, Metals and Materials under Pressure. Quantum–Based Atomistic Simulation of Metals at Extreme Conditions (J. Moriarty, J. Glosli, R. Hood, J. Klepeis, D. Orlikowski, P. Söderlind, and L. Yang). Effects of Microstructure on Spall Damage Localization in Shock Loaded Copper Multicrystals (S. Hashemian, S. Digiacomo, P. Peralta, H. D Armas, S. Luo, E. Loomis, D. Paisley, D. Byler, R. Dickerson, and K. McCllelan). Microstructural Modifications after Small Charge Explosions in Aluminum and Copper Targets (D. Firrao, P. Matteis, C. Pozzi, G. Scavino, G. Ubertalli, M. Ienco, G. Pellati, P. Piccardo, M. Pinasco, G. Costanza, R. Montanari, M. Tata, G. Brandimarte, and S. Petralia). Direct Density Measurements Using Plate Impact and Proton Radiography (P. Rigg, C. Scwartz, R. Hixson, A. Saunders, F. Merrill, and C. Morris). Micro–Structural Response of DP 600 to High Strain Rate Deformation (B. Hamburg, J. Schneider, and S. Jones). Shear Strength and Texture Evolution in Tantalum Foils (J. Escobedo, D. Field, and D. Lassila). Design of Highly Formable and Strong Titanium Alloys through Plasticity Induced Transformation (S. Neelakantan, P. Rivera–Díaz–del–Castillo, and S. van der Zwaag). Powder Metallurgy Processes for Producing Titanium Alloy Products from Hydrogenated Titanium Powder (J. Adams, V. Duz, and V. Moxson). Interaction between NiTi SMA and Graphite Mold in Unidirectional Solidification Process (M. Zhu, L. Wang, C. Li, Q. Zhai, and X. Mao). Viscosity of Slags for High Titanium Ferroalloy by Vacuum Refining (L. Jiao, T. Zhang, J. Yao, and J. Yao). Deoxidization Mechanism of In–Situ Electro–Deoxidization of TiO2 to Titanium (X. Zhai, Z. Zhang, J. Li, and M. Zhang). Investigating Macrozones in Titanium Billet using Electron Backscattered Diffraction (B. Wynne, P. Davies, and M. Rainforth). Research on Inclusion in High Titanium Ferroalloy (L. Jiao, T. Zhang, J. Yao, and C. Xing). Effect of Oxygen on Fracture Toughness and Stress–Corrosion Cracking of Ti–6211 (P. Pao, M. Imam, H. Jones, R. Bayles, and J. Feng). The Effect of Thermal Oxidation on the Fatigue Behavior of Ti6Al4V and Ti6Al7Nb Alloys (O. Meydanoglu, M. Cingi, M. Baydogan, H. Cimenoglu, and E. Kayali). Microstructural and Mechanical Behavior Characterization of Ultrasonically Consolidated Titanium Aluminum Laminates (T. Sano, J. Catalano, D. Casem, and D. Dandekar). The Effect of Processing Parameters on Biocompatibility of Micro–Arc Oxidized Titanium Alloys (M. Gunyuz, M. Baydogan, H. Cimenoglu, and E. Kayali). A Constitutive Model of Cavitation–Induced Damage in Ti Alloys (S. Keralavarma, and A. Benzerga). Anomalous Strain–Rate Dependence of Ductility in a Fully Recrystallized 50Mo–50Re Alloy at Room Temperature (J. Xu, M. Effgen, and T. Zhai). First Principles Design of Ductile Refractory Alloys (M. Gao, A. Rollett, M. Widom, O. Dogan, and P. King). Influence of Microstructure on the Fracture Toughness of Tungsten Alloys (B. Gludovatz, M. Faleschini, S. Wurster, A. Hoffmann, and R. Pippan). Oxidation Behavior of Alloys from the Nb–W–Cr System Containing C Modifiers (M. Gonzalez, and S. Varma). Summary of Interface Effects on Fracture and Fatigue of Laminated Aluminum Composites (H. Hassan, and J. Lewandowski). Evaluation of Variability on the Thermomechanical Response of Nitride Nuclear Fuels through Microstructurally Explicit Models (M. Garcia, S. Park, K. Wheeler, P. Peralta, and K. McClellan). A Study of Interfacial Growth Kinetics and Mechanics for an Fe Fibre Reinforced Al Alloy (S. Kenningley, S. Barnes, and P. Withers). Complex Oxide Materials – Synthesis, Properties and Applications. Nanostructures in Thin Films of ZnO (H. Bahadur, A. Sr.ivastava, Rashmi, and S. Chandra). Application of High–e Ceramics for Enhanced Sensitivity of Electron Paramagnetic Resonance Spectrometer (I. Geifman, I. Golovina, and A. Belous). Characterization of Anatase Synthesized by Sonochemical Means and Effects of Heat Treatments (L. Gonzalez–Reyes, I. Hernández–Pérez, H. Dorantes Rosales, E. Arce–Estrada, and F. Robles Hernández). Current Density Influences on Morphology and Adhesion of RuO2 - nH2O Films Electrodeposited on Tantalum Substrate (W. Gan, Z. Qin, H. Liu, and X. Shi). Study of the Superficial Behavior of Inorganic Pigments (Iron Oxides) (F. Vásquez Jiménez, O. Restrepo Baena, and M. Bustamante Rúa). Study on Structure and Properties of Glass Ceramics from Converter Slag (J. Mao–fa, Z. Da–yong, and S. Pei–yang). Synthesis of Superconductor Oxide Ceramics by Combustion of Carbon Nanoparticles (K. Martirosyan, E. Galstyan, Y. Xue, and D. Luss). Carbon Dioxide–Selective Membranes for Hydrogen Purification and Carbon Dioxide Capture (H. Bai, and W. Ho). Critical Material and Process Issues for CO2 Separation from Coal–Powered Plants (W. Liu, D. King, J. Liu, B. Johnson, Y. Wang, and G. Wang). Ceramic Coatings for Metallic SOFC Interconnects (J. Fergus). Novel Coatings for Stainless Steel Interconnects Utilized in SOFCs (W. Wei, N. Shaigan, W. Chen, D. Ivey, A. Wood, and S. Benhaddad). Investigation of Thin Film Mn–Co–Fe Spinel Oxide Coatings Deposited by RF–Magnetron Sputtering on Metallic Interconnects for SOFC Applications (C. Mardare, M. Spiegel, A. Savan, and A. Ludwig). Effects of Cell Operating Conditions on Degradation by Chromium (T. Cruse, B. Ingram, M. Krumpelt, S. Wang, and P. Salvador). The Operating Characteristics of Diesel–Driven SOFC (I. Kang, Y. Kang, S. Yoon, G. Bae, and J. Bae). Study on the Preparation of Dendritic Zinc Powder for Zinc–Air Battery by Electrodeposition (Q. Tian, X. Guo, D. Li, and J. Li). Coherent Carbon–Cryogel–Ammonia–Borane Nanocomposites for H2 Storage (S. Spehri, A. Feaver, T. Autrey, and G. Cao). The 50 K Anomoly in the Shear Modulus of ß–PdH0.71 (D. Safarik, and R. Schwarz). Effects of Partial Substitution of Al for Mg on the Electrode Properties of Mg2Ni Thin Film (J. Xu, Y. Li, and F. Wang). Wetting Kinetics of Eutectic Lead and Lead–Free Solders: Spreading over Cu Surface (H. Zhao, D. Reddy Nalagatla, and D. Sekulic). Mechanical Properties of Lead–Free Solder Joints – the Size Effect (P. Zimprich, U. Saeed, B. Weiss, and H. Ipser). Microstructure, Defects, and Reliability of Mixed Pb Free/SnPb Assemblies (P. Snugovsky, H. McCormick, S. Bagheri, Z. Bagheri, C. Hamilton, and M. Romansky). Characterization of Tungsten Carbide Electrical Contacts for High–Temperature Electronics (L. Wilkinson, C. Muntele, S. Budak, and D. Ila).